Time Guitars • View topic - Model Identification. Your guide for identification. Model Identification. Your guide for identification. Here's a quick stab at explaining the models. I've included more photos on the early Time shop. These were provided by SollyDad. Thank you! All early models used a 2 letter 2 digit combination. The letters refer to the body style and scale length and the 2 numbers represent the 'TRIM' & wiring level. i.e Binding, woods for fingerboard, and inlay complexity. All 24 1/2" scale guitars have 1 12" fretboard radius. All 25 1/2" scales guitars have a 9" radius. Other little things that only Time used. The pickguards are held on by #4 slotted wood screws. Not the philipps head screws everyone else used. Well, the black hardware guitars had black philipps head screws. Also, the humbuckers were adjusted with 3 screws not 2. 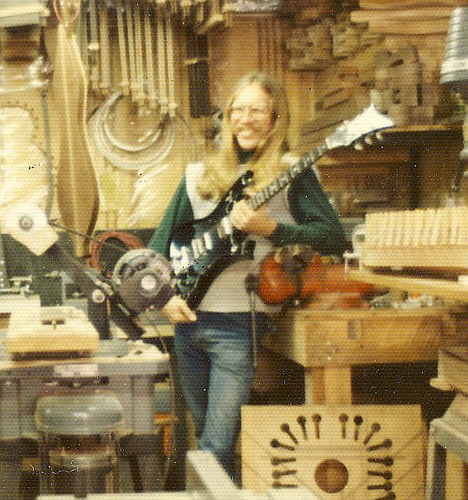 Here is the very first GS guitar from the Waltham shop in 1976. Notice the P90 pickups on this one. This guitar would be right at home today with Billy Joe Armstrong from Greenday! The GS Bass. This one is the 1st Time Bass built in 76 for Casey. Casey played with the band Road Apple. Jimmy Carter also played a GS Bass in Sass & Run21. The TC [Time Caster] all had 25 1/2" scale, double cutaway bodies. Think Fender here. Many of these guitars had maple fretboards. Explorer [EX] 24 1/2" scale. This is an EX-1 with 1 pickup and a Floyd Rose. Flying V [designed by Chris Clark & Alan Stack] 24 1/2" scale. This V is smaller than a Gibson V Body. Our planer only allowed bodies 13 1/2" wide. 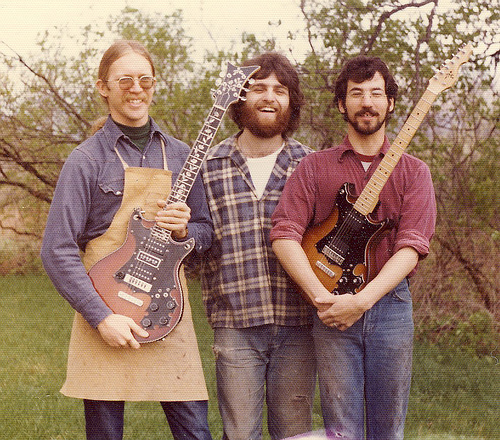 Later guitars designed by Chris Clark. The IC [Ichabod Crane] were headless guitars similar to Steinberger. 24 1/2" scale. All the switching and control is on the top bout. Master volume on face. The guitar pictured belongs to Johnny Winter. A custom version of this guitar had a Bat Man theme complete with Bat wing shaped body, Bat Light graphic on the back and the cheezy comic book 'wham'' etc on the fretboard. Paul Languedoc designed this one-off with Tim Schner handling the comic book finish. Mini Tele [electric mandolin] 5 String Mandolin originally built for Jimmy Ryan. [Blood Oranges/Beacon Hillbillies] I think 4 or 5 of these are 'in the wild'. 1985 Mini Time Caster. 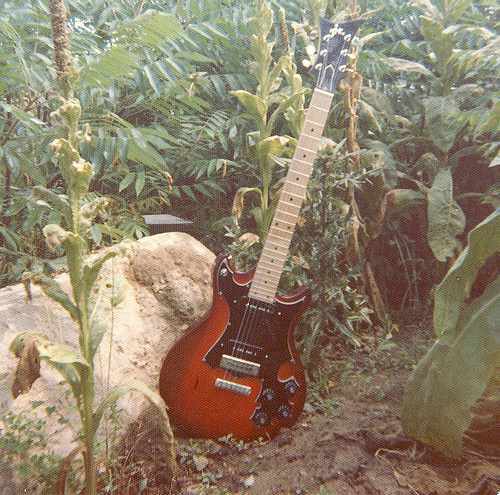 This was a six string modeled after the Time Caster but shrunk down to a short scale. Often called an octave guitar, these actually sported a Gibson F-5 scale length and were not really '1/2 scale' guitars. This is the same as the Mandolin above. Trey took a Blue MiniCaster to Europe. This is from my own collection. Starting in late 1984 several new models were created. These guitars have thru the back controls. During this time, we started calling the trim levels Standard and Artist. Before this the guitars with the high level trim options where called '12's. Ie. GS-12, EX-12 etc. Standards had rosewood boards and Dot inlay. We used a variety of Rosewoods, but mostly East Indian. Decal Time logo on headstock. The Artist option would have the 'best' woods, Ebony boards. A single laminate of Black Walnut on the neck bookmatch. Pearl logo and diamond inlay. Binding with Stripe, Checkerboard or Flight strip. Hand carved 'Vee' on the back of neck. The 1984 PrimeTime. 24 1/2" scale. Thru the back controls. Very pointy shape modeled after the B.C Rich Warlock. The lower horn was inspired by Philip Kubicki's Factor bass. Here's the Prime Time Bass. The 1985 AdvanceTime. Originally designed for the Advance Music Store in Burlington, Vermont. 25 1/2" scale. Thru the back controls. As we know now this is the so called 'Super Strat'. Near the end of Time, we started doing Alder bodies because they were popular. These typically had black hardware, 1 pickup and Floyd Roses. The rise of Eddie Van Halen changed what guitar players were buying. Before the GS and Timecasters there were the Acoustics with the huge Bat Wing headstock and very complex bracing system using maple and ebony braces. These were awesome sounding guitars. During this time there were Dulcimers too... The dulcimers were built by Noobs for training. Here's a couple of pics from John S.
Here's a shot of the bracing in an acoustic. Note: It doesn't have all the ebony braces added yet. Here is the Waltham Crew in 1976. Left to right John, Robert, & Harry. 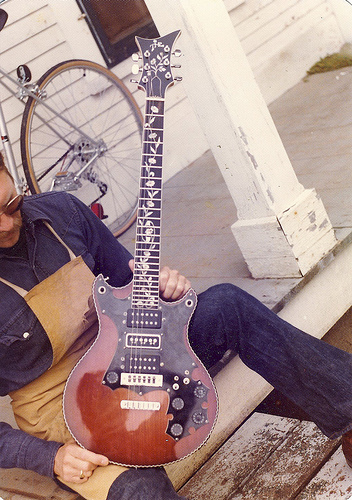 John is holding Johnny Moore's incredible GS guitar. Here's another picture of the Johnny Moore GS. This is the guitar that put Time on everyone's radar! 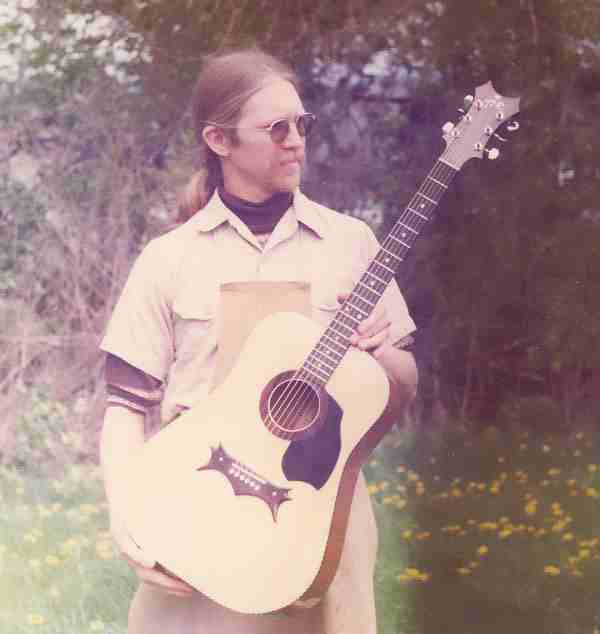 This is a bolt neck Original TimeKaster from the early days. i.e. 1973-6. This is #22 built at Darrell's Music in 79. This is John S. in Waltham with the very 1st Time Electric. 1973-4. Also notice the Time Dulcimer hanging from the ceiling and Alan's fret slot cutting saw in the foreground. Here's a Cosmic Ray from the Willis collection. Last edited by ChrisClark on Sun Feb 18, 2007 2:59 pm, edited 3 times in total. That Time Caster bass (right above the EX-1) belongs to John Lilja, a bass player who used to live in Vermont but now lives in Norway. He contacted me via Facebook and wrote "That picture on the Time forum is a pretty recent picture, maybe two years old, taken in my dining room in Norway. I´d posted it on some other message board. Crazy that it shows up on another board!" If you have a Time photo, We want to see it! Bill, That's interesting. Maybe John could post about his bass? I found that TCB-7 picture during a extended Google session. When this site started, I was always searching for those elusive Time photos. 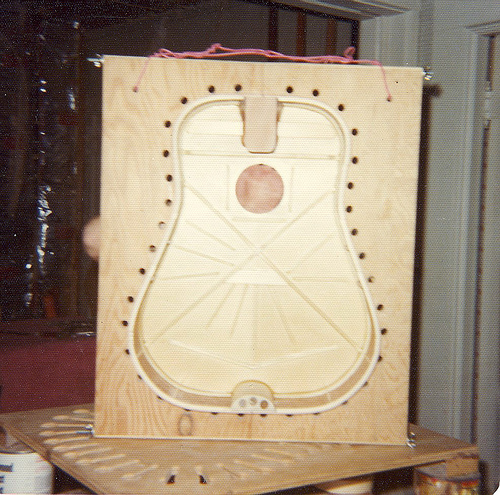 Outside of the Early Time brochure, that is the only known photo of a Time Caster Bass! Well, I still do Google searches, but I quit after the 1st 20-30 pages. Other examples are Tom Plunket's V and GS. He had posted about Time on http://www.fancy.org and Steve Nolan's GS that he posted on his site.